The firm consists of Charles E. Ridenour and Kathryn R. Hatfield. Charles has practiced law in Monroe County for since 1980. Katie joined the firm in 2008. Both are well known and respected in their community and represent a wide range of individuals and businesses. The Firm provides representation and advice in a variety of legal matters before state and local courts, government agencies and alternative dispute resolution forums, such as mediation. The firm is experienced, effective and will work diligently to ensure all claims are resolved through professional negotiation, mediation, or litigation in order to secure the financial compensation to which their clients are legally entitled. Please contact us and allow our firm to assist you with your legal needs. Charles Ridenour is a 1978 graduate from the Nashville Law School where he received his Doctor of Jurisprudence. He was licensed to practice law on April 26, 1980 (#3884). He is has been a member of the Monroe County Bar Association since 1980 and was President from 1984 and 2001. He is a Rule 31 Civil and Family Mediator and has a wealth of experience as an attorney. He is Legal Counsel for the Sweetwater Utility Board, The Sweetwater Housing Authority, Kyker Funeral Homes, and Woods Mobile Homes. Kathryn Hatfield "Katie", is a 2001 Graduate of Carson-Newman College with a Bachelor of Science degree in Business Management; a 2002 graduate of Middle Tennessee State University with a Masters Degree in Business Administration, and received a Juris Doctor degree in 2008 from the Nashville School of Law. Katie joined the law firm of Ridenour & Hatfield in October of 2008. 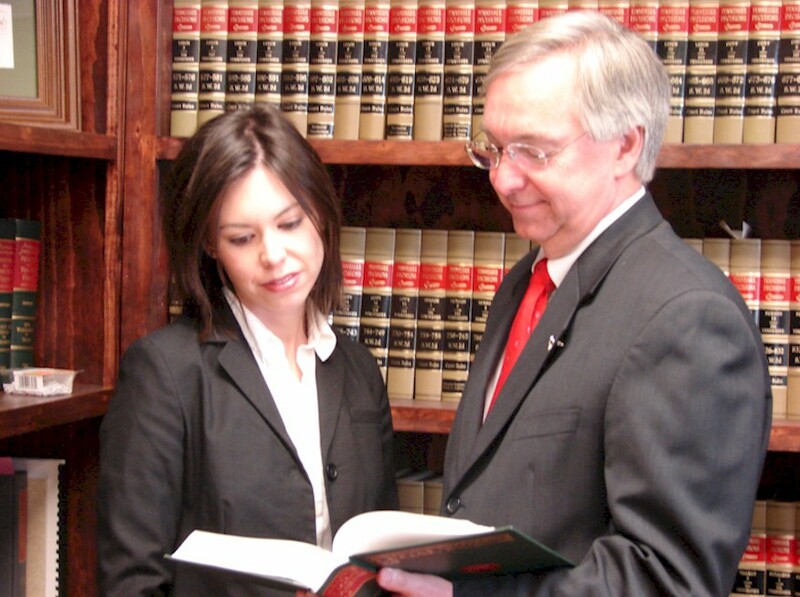 Katie is licensed to practice law in the Tennessee State Courts and the United States District Courts. She is a member of the Monroe County Bar Association, the American Bar Association and First Baptist Church, Sweetwater. Katie is also on the board of directors for Branches of Monroe County. In addition to Charles and Kathryn, the firm has a well trained and cohesive team of personnel. The support staff work efficiently and with precision in order to meet the client's need. We provide our clients with professional and diverse representation. We represent clients in the Monroe, Loudon, McMinn, Meigs and Roane counties of East Tennessee, in a wide range of matters, including cases involving: Motor Vehicle Accidents/Personal Injury, Real Estate, Foreclosures, Deeds and other Real Estate transactions, Probate, Wills, Powers of Attorney, Social Security Disability, Contracts, Leases, Workers Compensation, Divorce and Family Matters. When you experience a loss because of someone else's negligence, you have a right to seek financial recovery. We are here to do everything we can to see that you get the money you need to meet the expenses related to your injury and to compensate you for medical bills, lost wages, pain and suffering.